Fucoidan AF Premium raw material Mosuku is 100% Okinawawa mozuku from Okinawa. There are three reasons for sticking. When compared with wakame seaweed and konbu, Mozuku contains about five times the amount of fucoidan. Most of it is a bit thicker Mozuku (Okinawa Mozuku) that can be taken in a warm sea like Okinawa. Because it has good taste and texture, most Japanese prefer to eat this Mosuku. In our company, we have selected products with a large amount of fucoidan among them, and commercialized them. Fucoidan is contained in 85% of Okinawa mozuku we deal in our company, and it was understood that it is high purity in the world. 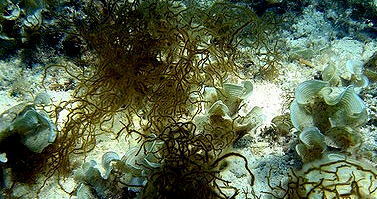 Mozuku has the property of absorbing vitamins and minerals contained in seawater into the body and growing it. Therefore, "sea water" is very important for Mozuku. Well, what will happen if that Mozuku grows up in sea water where water pollution progresses and contains chemical substances, radiation substances, heavy metals, etc.? Of course, such a chemical substance is used in the body of Mozuku, and it comes into Fucoidan as well. * There is inspection result of Japan Food Analysis Center, Japan Frozen Food Inspection Association. We are stuck to sea water where Mozuku grows, sea water where fucoidan grows, because it is drunk by drastic people. It is about sulfate group which can not be used for the power of fucoidan. The amount of sulfate group of Fucoidan AF Premium is very high, 290 mg (out of 100 g), which is more than 13 times that of ultra low molecular fucoidan we have sold so far. At the time of the release of low-molecular fucoidan about ten years ago, almost no purification technique of fucoidan was established. Fucoidan of refined raw material was few, and at that time it was said that Tonga production is good.However, as refining technology evolved, raw materials fucoidan was refined by many suppliers. As a result, it was found that Fucoidan derived from Okinawa Mozuku is higher in quality than Tonga, and is also rich in components such as fucose and sulfate group. Fucoidan refined in Okinawa Mozuku from Okinawa is now a high standard of fucoidan that is proud of the world.